Cesar Altieri Sayoc, 56, charged with 5 federal crimes in suspected 12 package mail bombs sent o leading Democrats, prominent activists and members of the media. and members of the media. 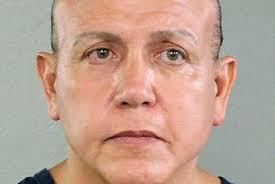 VietPress USA (Oct. 26, 2018): Cesar Altieri Sayoc sent at least 12 mail bombs to leading Democrats, prominent activists and members of the media. There are multiple Facebook accounts, a LinkedIn account and a Twitter page that appear to belong to Sayoc. They show his name and display many photos that strongly resemble the man who was taken into custody by the FBI on Friday. The postings appear to be from an ardent supporter of President Trump, one who despised many Democrats. Social media pages that appear linked to Cesar Altieri Sayoc displayed evidence of emotional turmoil and political anger before he was arrested on Friday and identified as the suspect behind at least 12 mail bombs sent to leading Democrats, prominent activists and members of the media. The person identifying himself as Sayoc described himself as an entrepreneur, or, as he put it on LinkedIn, a “Promoter, booking agent Live entertainment, owner, choreographer.” In multiple pictures on Facebook, the person identifying as Sayoc can be seen wearing a pro-Trump “Make America Great Again” hat and attending Trump campaign rallies. In the months leading to Trump’s election in 2016, the Facebook pages regularly promoted articles containing bizarre conspiracy theories about Democrats — including allegations that Trump’s rival, Hillary Clinton, sold weapons to the jihadist group ISIS, claims that Democrats were “buying votes” and rumors of an imminent Muslim terrorist attack. Based on the Facebook posts, the person identifying as Sayoc was fixated on the idea that America would be at risk of terror under Clinton. “Wake up America FBI director warns an attack like never seen before here in America will happen. We can’t afford risk American lives with Hilary Clinton. They will infiltrate refugees guaranteed,” the person wrote. Postings that seem to have come from Sayoc don’t just express admiration for Trump’s politics. In an October 2016 Facebook post, Sayoc credits Trump’s business strategies with helping him open a sports bar. “Thank you President Trump for all advice strategies, that worked to close on our soon to be … Knockers Sports Grill. We followed exactly the formate you laid out for us,” Sayoc wrote. Postings on the pages that appear to belong to Sayoc also attacked the media. In recent months, the postings on those pages became less coherent and more ominous. On July 14, one of the Twitter accounts posted a link to a video that purportedly showed a video of a python swallowing a live human. “This one for you MSNBC Andrea Mitchell. A promise reply to your threats. We will answer is coming see you soon,” Sayoc wrote. “We will see you 4 sure,” the message said. Last Friday, Sayoc wrote multiple tweets that seemed to be in response to a video from the celebrity gossip site TMZ, where the rapper TI criticized Trump. “You biggest piece crap media TMZ , that were complete silent Obama separating kids. Shut your hole TMZ before u end like media slime Saudi Arabia. No one deserves it better than fake fraud Washington Amazin owned post. We Unconquered Seminole Tribe agree,” Sayoc wrote. “Unconquered Seminole Tribe” is a phrase that appeared multiple times in the Twitter postings. In several tweets, the person who identified as Sayoc posted pictures showing a flag for the “Unconquered Seminole Tribe for Florida” and expressing support for a pair of Republicans in the state, Senate candidate Rick Scott and gubernatorial candidate Ron DeSantis. Under his nonsensical screed against TMZ and the Washington Post, Sayoc posted pictures of three tarot cards featuring images of death.